This makes me feel lucky, I’m glad that the oxygen increased because if it didn’t I wouldn’t be here typing this and nonexistence, though I’ve never experienced it, doesn’t sound as fun as existence. However I also feel like it would be impossible for “me” not to have existed at some point somewhere and be having these thoughts….and I’ll explain why. Evolutionary theorists and the secular progressive movement that their work has inspired insist that evolution is the fundamental truth of life on earth. They view religion as a weakness of the mind and react in utter horror to the teaching of “intelligent design” theories in public schools. Their ultimate view of the universe can be summed up something like this: The universe formed during the Big Bang, stuff collided, stars, planets, etc., life comes along, dinosaurs, mammals, humans, and then you die and nothing happens and the universe will either expand forever or collapse on itself and start over, human consciousness is snuffed and some objective state of the universe will continue but it won’t be of any consequence to us because we’ll all be dead and won’t know any better. I pretty much agree with them…. Human consciousness is a mysterious thing. It is even more mysterious because what it is, essentially, is the universe becoming conscious of itself. Think about it….someone can help me here, I just know it…. 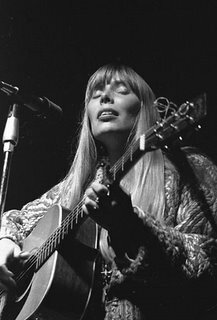 Oh, right…thanks, Joni, we are stardust. Human beings are nothing more than combinations of elements that have been subjected to evolved patterns of brute interactions that have produced a system that is capable of taking information and reflecting upon that information consciously. Everything else that we can perceive in the universe (using that very system to which I just referred) is essentially brute forces interaction with one another. So what does it mean that the universe has become self-conscious? I have no idea…but that’s the beauty of it…neither do they, secular progressivists, that is. They can’t say that intelligent design isn’t true anymore than I can say evolution isn’t true (for the record, I think that the popular notion of intelligent design that goes by the Biblical account of creation is not true at all, but I think intelligent design theories, per se, (non-religious creation myth oriented) don’t deserve to be summarily discredited). Can you explain human consciousness? Why (not)? The only answer to this is “no”, because human consciousness is such, but also, in a broader sense, it is “universe consciousness” as we discussed above. As weird and hippy-cult-like as that sounds, it’s true and cannot be refuted – we literally are the universe interpreting itself. The secular progressivist will have to agree with you here. Ok then, if human consciousness is the universe interpreting itself, then to explain it away as something insignificant in the scheme of the universe that dies when the human form dies will require you to explain the universe….go ahead. There is no explanation for the universe. It operates using the mechanism of evolution, but a complete explanation would have to include at the very least how it began and what came before it. Our limit of scope is the Big Bang, and we have absolutely no idea what happened before that…so you really can’t explain the universe. If he/she doesn’t agree with you on this point, argument over, you win. Since you can’t explain human consciousness, or the existence of the universe, how can you be so sure that there isn’t something going on out there that we have no idea about that would prove you wrong…I’ll freely admit that it may prove me wrong. Don’t you think that with our biases in how we view time and space (think about it – the average lifespan is about 80 years max, earth is the extent of our space – compare that to the size and age of the universe) there may be something intelligent going on that we cannot detect. I assure you that I am not an evangelical Christian. I’m only saying that nobody knows “the truth” about the universe and to say you do only reflects your own ignorance. Finally, think about this: The science that people use to discredit intelligence in the universe is a creation of the intelligence of the mind, which is a creation of the universe. In a very real way, the universe (channeled through its manifestation as the human brain) invented science…and every other feat that the human brain has achieved. I’m not saying that humans aren’t special, but like I said at the outset…everything is connected to everything else, the human brain is simply the most elaborate information processing device that the universe has created (out of itself). This is all strange and confusing, but all I’m saying is this…don’t give up on God, don’t give up on life, don’t become an atheist just because some smarty pants scientist tells you to. Their beliefs are rooted in science as the new God, but in their arrogance they forget that there are plenty of mysteries yet to be solved…and they don’t have all the answers. I know I’m skimming the surface of some deep philosophical oceans that I’d drown in if I tried swimming, so if you are reading this and feel that you are smarter than me because you know a lot about this stuff, I apologize…this is a blog after all…I don’t need some haughty comment railing me about some advanced scientific concepts…I admit my ignorance, let that satisfy your thirst for being smarter than others.